Authorities investigating the deadly bombings at the Boston Marathon have zeroed in on a man seen on surveillance video near the site of the attack. Sources say investigators are trying to identify a person described as a young white man who is standing in the crowd near the scene of the second bombing just before the device exploded, reported CBS News correspondent Bob Orr. A surveillance camera at a nearby Lord and Taylor department store captured images of the man who was carrying a backpack and talking on a cell phone. The man was wearing a black jacket, a grey hooded sweatshirt and a white or off-white baseball cap backwards. He is 6 feet or 6-feet-2-inches tall with a medium build. Investigators say the man, who seemed to be alone, put the backpack on the ground. Then, when the first explosion occurred at the finish line about 100 yards down Boylston Street, he took off. Just a few seconds later, the second bomb exploded near where the man had been standing. Sources say forensic experts tape will attempt to use facial recognition software and compare the images from the surveillance camera to photo IDs connected to known cell phone users. Officials say so far they have not identified that mystery man and they're not yet calling him a suspect. CBS News senior correspondent John Miller said that the big case Wednesday was whether to make the case to release that photo and go out and say this is the person who is being sought or to hold that back. "It's been a tough call," said Miller. "For investigators, there's always a difficult choice because if the person doesn't know you're looking for him, he may stay in place, you may catch up to him. if he does know you're looking for him, he may run. On the other hand, if you don't get him, it's always great to enlist 20 million or so more eyes in the public who may be able to give you a location right away. That's not going to happen tonight anymore. It was going to happen earlier -- they've rethought that. It may happen with the release of that picture tomorrow. They're reassessing. Meanwhile, investigators have found the lid of a pressure cooker that apparently was catapulted onto the roof of a nearby building, a law enforcement source said Wednesday. The law enforcement source confirmed to CBS News senior investigative producer Pat Milton Wednesday that the lid was found on the top of a building near the attack site. The developments come after an intelligence bulletin issued to law enforcement and obtained by The Associated Press and the Reuters news agency late Tuesday included pictures of a mangled pressure cooker, a torn black bag, a circuit board and a battery connected to wires, all of which the bulletin said were from the two bombs used in the attack. The blasts killed 8-year-old Martin Richard, of Boston, and 29-year-old Krystle Campbell, of Medford, Mass. On Wednesday, CBS News confirmed that the third fatality has been identified as Lu Lingzi, a 23-year-old graduate student at Boston University from Shenyang, China. Both explosive devices appear to have been placed in sealable metal pots called pressure cookers and packed with nails and ball bearings designed to amplify the damage from the explosions, Orr previously reported. Investigators believe the bombs were hidden in black nylon backpacks and housed inside the pressure cookers. Pressure-cooker bombs can help boost the power of relatively small devices by briefly constraining the blast. When the cookers do explode, they can add large chunks of metal to the shrapnel spray. The improvised explosive devices have been popular with terrorists. Al Qaeda published a how-to recipe in an online jihad magazine. Several of the bombs were used in the 2006 attack on trains in Mumbai, India. Pressure cooker explosives have been recommended for lone-wolf operatives by al Qaeda's branch in Yemen. The FBI and other law enforcement agencies repeatedly pleaded for members of the public to come forward with photos, videos or anything suspicious they might have seen or heard. "The range of suspects and motives remains wide open," Richard DesLauriers, FBI agent in charge in Boston, said at a news conference Tuesday. He vowed to "go to the ends of the Earth to identify the subject or subjects who are responsible for this despicable crime." President Obama branded the attack an act of terrorism but said officials don't know "whether it was planned and executed by a terrorist organization, foreign or domestic, or was the act of a malevolent individual." Mr. Obama plans to attend an interfaith service Thursday in the victims' honor in Boston. He has traveled four times to cities reeling from mass violence, most recently in December after the schoolhouse shooting in Newtown, Conn. Heightening jitters in Washington, where security already had been tightened after the bombing, the Secret Service quarantined a suspicious letter addressed to Mr. Obama that is being tested for the toxin ricin, CBS News learned Wednesday. On Tuesday, a letter addressed to a senator and initially tested positive for ricin was intercepted at a mail facility outside the capital, lawmakers said. There was no indication either episode was related to the Boston attack. Senate Majority Leader Harry Reid said Tuesday's letter was addressed to Republican Sen. Roger Wicker, of Mississippi. In Boston, scores of victims remained in hospitals, many with grievous injuries, after the twin explosions near the marathon's finish line killed the three people, wounded more than 170 and reawakened fears of terrorism. A 9-year-old girl and 10-year-old boy were among 17 victims listed in critical condition. DesLauriers confirmed that investigators had found pieces of black nylon from a bag or backpack and fragments of BBs and nails, possibly contained in a pressure cooker. He said the items were sent to the FBI laboratory at Quantico, Va., for analysis. The FBI said it is looking at what a Boston television station said are photos sent by a viewer that show the scene right before and after the bombs went off. One photo shows something next to a mailbox that appears to be a bag, but it's unclear what the significance is. "We're taking a look at hundreds of photos, and that's one of them," FBI spokesman Jason Pack said. Investigators said they haven't determined what was used to set off the explosives. DesLauriers said there had been no claim of responsibility for the attack. He urged people to come forward with anything suspicious, such as hearing someone express an interest in explosives or a desire to attack the marathon, seeing someone carrying a dark heavy bag at the race or hearing mysterious explosions recently. "Someone knows who did this," the FBI agent said. The bombs exploded 10 or more seconds apart, tearing off victims' limbs and spattering streets with blood, instantly turning the festive race into a hellish scene of confusion, horror and heroics. Doctors who treated the wounded corroborated reports that the bombs were packed with shrapnel intended to cause mayhem. "We've removed BBs, and we've removed nails from kids. One of the sickest things for me was just to see nails sticking out of a little girl's body," said Dr. David Mooney, director of the trauma center at Boston Children's Hospital. Dr. Peter Burke, chief trauma surgeon at Boston Medical Center, said Wednesday that the hospital performed seven amputations on bombing patients. He said a large volume of fragments pulled from the victims were sent to the pathologist and available for police to review. Burke said two of the hospital's patients, including a 5-year-old child, remain in critical condition. He said he expects both to survive but "until they are home, I won't be satisfied." At Massachusetts General Hospital, all four amputations performed there were above the knee, with no hope of saving more of the legs, said Dr. George Velmahos, chief of trauma surgery. "It wasn't a hard decision to make," he said. "We just completed the ugly job that the bomb did." In the wake of the attack, security was stepped up around the White House and across the country. Police massed at federal buildings and transit centers in the nation's capital, critical response teams deployed in New York City and security officers with bomb-sniffing dogs spread through Chicago's Union Station. Homeland Security Secretary Janet Napolitano said that the stepped-up security was a precaution and that there was no evidence the bombings were part of a wider plot. Pressure cooker explosives have been used in Afghanistan, India, Nepal and Pakistan, according to a July 2010 intelligence report by the FBI and the Department of Homeland Security. One of the three devices used in the May 2010 Times Square attempted bombing was a pressure cooker, the report said. "Placed carefully, such devices provide little or no indication of an impending attack," the report said. The Pakistani Taliban, which claimed responsibility for the 2010 attempt in Times Square, has denied any part in the Boston Marathon attack. Al Qaeda's branch in Yemen gave a detailed description of how to make a bomb using a pressure cooker in a 2010 issue of Inspire, its English-language online publication aimed at would-be terrorists acting alone. In a chapter titled "Make a bomb in the kitchen of your mom," it says "the pressurized cooker is the most effective method" for making a simple bomb, and it provides directions. The tightly sealed pot makes easier-to-obtain but weaker explosives faster and stronger, amplifying the blast and the carnage. Naser Jason Abdo, a former U.S. soldier, was sentenced to life in prison last year after being convicted of planning to use a pair of bombs made from pressure cookers in an attack on a Texas restaurant frequented by soldiers from Fort Hood. He was found with the Inspire article. Investigators in the Boston bombing also are combing surveillance tapes from businesses around the finish line and asking travelers at Logan Airport to share any photos or video that might help. "This is probably one of the most photographed areas in the country yesterday," Boston Police Commissioner Edward Davis said Tuesday. 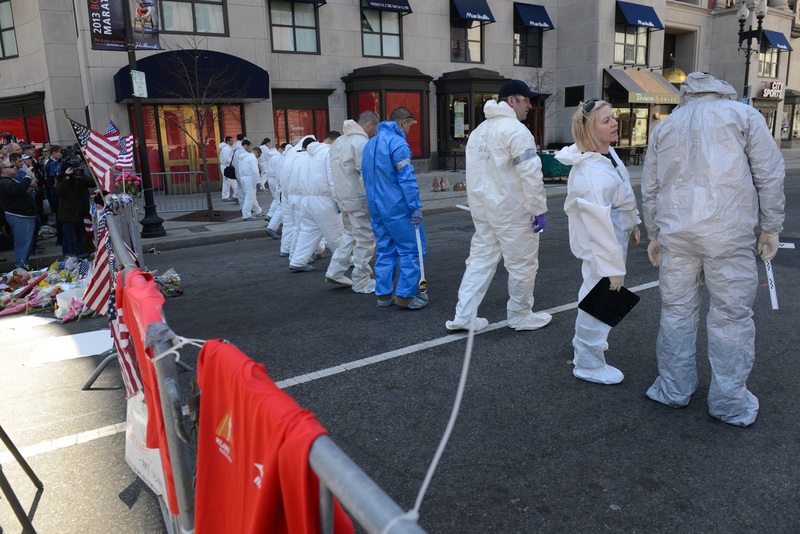 He said two security sweeps of the marathon route had been conducted before the bombing. Boston police and firefighter unions announced a $50,000 reward for information leading to arrests. On April 21, 1918, German fighter pilot Manfred von Richthofen was shot down over France. Lee Cowan reports.